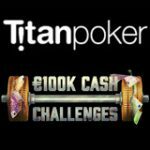 Titan Poker October Missions Boost offers players the chance to win their share of €100,000 in prizes this October. Complete the simple objectives of the weekly Titan Poker Missions and get tournament tokens to the October Mission Freerolls. 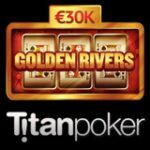 The TitanPoker iPOPS Micro series starts on September 28th and players are required to play at least one event to complete the first mission. 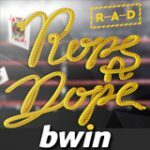 New players get a 200% first deposit bonus to a maximum €1,500 plus a welcome package with freeroll tokens. 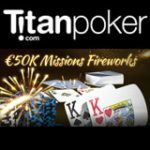 There are six missions to complete between September 28th - October 25th, complete the missions to get your share of €100,000 in Titan Poker freeroll prize pools. Get your tournament tokens to the daily and weekly Titan Poker October Missions Boost freerolls, there are up to two missions per week to complete. 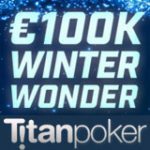 Mission: Make a deposit of at least €10 and play a Titan Poker iPOPS Micro tournament. Prize: 1x tournament token to the €25,000 October Mission 1 freeroll. Mission: Make it to paying position in any real money tournament. Prize: 1x tournament token to the daily €1,000 October Mission freeroll. Mission: Make it to paying position three times in any real money tournament within three days. Prize: 1x tournament token to the €15,000 October Mission 2 freeroll. Mission: Make a deposit of at least €10 and play at least three tournaments. 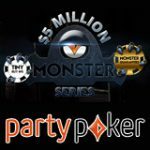 Prize: 1x tournament token to the €25,000 October Mission 3 freeroll. Mission: Play two poker tournaments in the same day. Mission: Play two poker tournaments for three or more days. 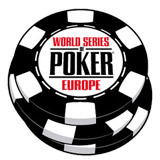 Prize: 1x tournament token to the €15,000 October Mission 4 freeroll. 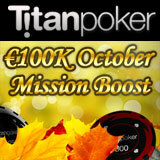 Register for the Titan Poker October Missions Boost tournaments in the lobby by clicking on 100K Mission Boost tab. 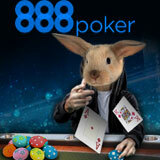 The October Missions Boost freerolls are restricted to the first 7,500 players that register.